The facts remain very dynamic for Oil. The US is continuing to produce more and more oil and is expected to become a “net exporter” of oil this year. Economic issues will, eventually, resolve themselves, yet we don't know the final outcome of these trade deals or how the economy will react to any milestones that are required within the final settlement. And, again, these continuing issues in Libya, Syria and near this region are likely to cause some increased levels of uncertainty over the next 60+ days. At this point, we would urge Bullish Oil traders to start to become more cautious of any downside risks and begin to prepare for increased volatility. 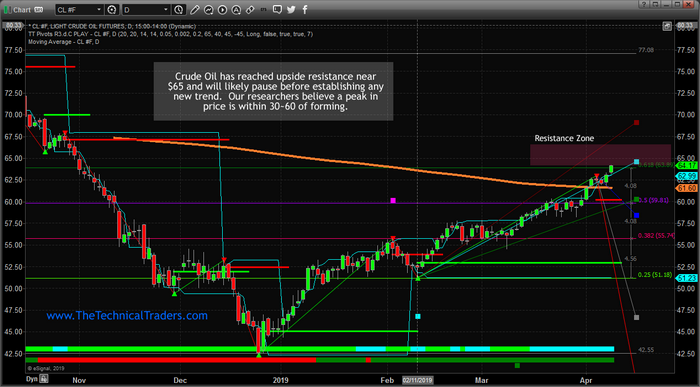 We don't have any real clue as to how this move will setup, but we do believe our other research support increased volatility within the Crude Oil markets and the potential for a new downside price swing before any further upside move sets up. We've recently launched a new technology solution for our members that delivers our incredible research and trading solutions. You can also visit www.TheTechnicalTraders.com/FreeResearch/ to learn more about our research team and past article. 20129 is going to continue to be an incredible year for skilled traders – you won't want to miss these big moves that are setting up.